I’ve tried aloe vera infused skincare products from masks, face wash, and face scrub to moisturizer before, but the Aloe Vera Gel in tub just like Mumuso 92% Aloe Vera Gel was indeed life-changing experience for me. I never thought how beneficial aloe vera could be for my skin, especially the concentrated ones. I put Aloe Vera Gel in the same spot as Human Nature Sun Flower Beauty Oil. Those multi-purpose products that really works. Just like me, you will easily get addicted with this product because it works well whether you use it day or night. 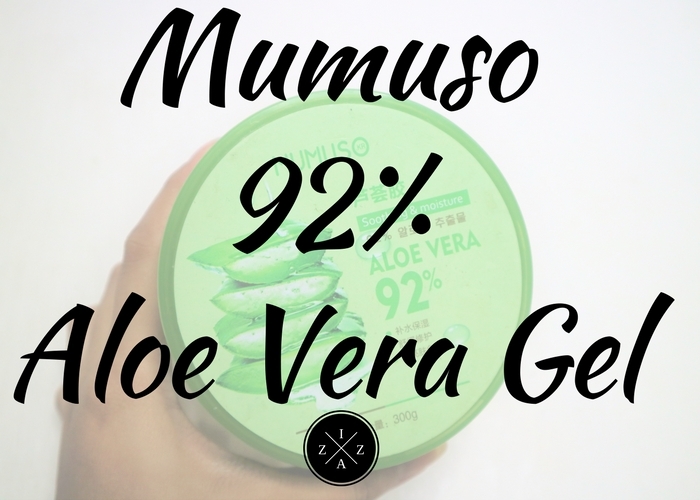 The product that I’ll feature in this post is Mumuso 92% Aloe Vera Gel. But, I’m also aware how other aloe vera gels in tub exists in the market today. I believe Nature Republic 92% Aloe Vera Gel is the most famous one among the rest. I also saw Bench (yes, the clothing line) carrying their own version of aloe vera gel in their skincare section. The Face Shop also has their own. I bought Mumuso 92% Aloe Vera Gel upon my visit in Mumuso Farmer's Plaza Cubao. It looks very similar to the Nature Republic 92% Aloe Vera Gel but way cheaper. Mumuso sells the aloe vera gel in the Philippines for 99pesos only compared to Nature Republic’s 249pesos. I can’t make a concrete comparison between the two when it comes to how effective since I haven’t tried the Nature Republic 92% Aloe Vera Gel. But I saw a video in YouTube sharing how these two products came from the same supplier daw. Kumbaga pinalitan lang ni Nature Republic yung sticker niya. You can watch the video here. Also note that there are a lot of fake Aloe Vera Gels from different brands being sold online for cheaper price. These fake aloe vera gels can give you serious problem and may not even give you the same benefits. Just be careful and buy only on legit shops. You will get 300g of Aloe Vera Gel for less than 100pesos! Sulit! Aloe Vera, in generally used as remedy for skin problems like burns, psoriasis and dryness. It is also good for acne-prone skin because it speeds up the healing of the bumps. Aloe vera is even used as ingredient on soaps, lotions, creams and other skincare products. The Mumuso 92% Aloe Vera Gel contains 92% Aloe Vera, Hyaluronic Acid, Pro Vitamin B5 and Vitamin E. It is a mild and soothing gel you can use on the face and body for a number of ways. I experienced no problem in the months that I’ve used the Mumuso 92% Aloe Vera Gel. I don’t think that it is fake although it is super cheap. The product is in clear thick gel that melts like water upon application. It smells like real aloe and gives a fresh and cooling effect when applied. Fresh acne heals faster because of the aloe vera gel too. And although there’s no significant change brought on my dark spots and acne marks, the mere fact that the look and feel of my skin improved is such a blessing for me already. For severe acne and those who have sensitive skin I highly suggest testing the product first on your palm to see if you will have any bad reaction. Last February2017 I skipped using this at night because I testing the Avon Anew 360Illuminating Set and it includes a night cream already. I tried using it before the day cream and it worked. I was surprised that the aloe vera gel dries fast and is easily absorbed by my skin even in day time. It works as a natural moisturizer and doesn’t feel any sticky at all. Sometimes I will use the aloe vera gel as a hair treatment. After I shampoo and wash my hair thoroughly I will apply a scoop or two of Mumuso 92% Aloe Vera Gel and massage on my scalp and hair ends. Then let it stay for good 5-7 minutes before rinsing. I love how soft, healthy and shiny my hair gets as it air dry. I noticed how my hands get easily dry at work and so I always make sure to use some aloe vera gel before leaving the house. It acts as natural moisturizer when rubbed between hands. You can also put a mixture of alcohol and aloe vera gel on an empty sanitizer bottle for your own personal hand sanitizer. I’m glad to have discovered the benefits of aloe vera gel thanks to Mumuso 92% Aloe Vera Gel. The cooling effect it gives ever after use is awesome now with the hot weather. I also can’t wait to share my current skincare routine which is simpler compared to the last I blogged. It is a product you’ll definitely want to have a backup. Since I already emptied my Mumuso one, I’ll probably purchase the Nature Republic next just to compare whether there’s any difference really. Have you tried Mumuso 92% Aloe Vera Gel, too? Do you use aloe vera gel as a mask?? REVIEW | L'oreal Visible Lift Serum Inside Instant Lift Foundation | REVIEW | Olay Total Effects 7in1 Foaming Cleanser | SOMETHING NEW | Face Masks from Watsons - New! Where did you bought it po? Hi sis! May mare recommend po ba kayong cream na effective para sa dark spots sa face? maganda yung product niya. AS IN. I use it everynight at ang gaan gaan ng pakiramdam ng face ko kinabukasan.